I haven’t played along with the Muse Card Club for a while now but love all the fantastic cards inspired by the Muse each week. I decided while my golfing family played 18 holes today, I would play with my stamps although they are strewn around in a big mess from the move. But I did get my paws on some fun new items coming up in the new Occasions catalog debuting on January 3rd – the SU Petite Petals and the coordinating punch! 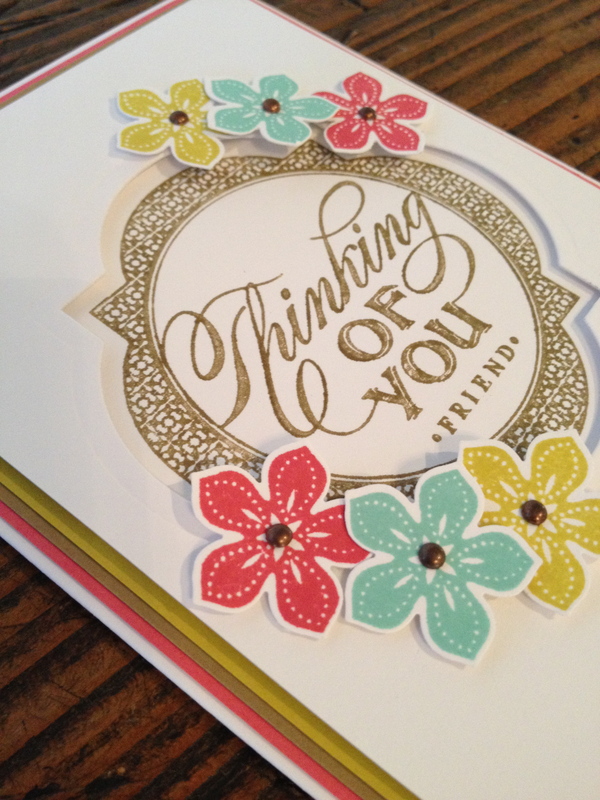 Oh my gosh, I just love this stamp set… and this is only one of the six flowers included in the set! And, of course, a punch to match- can’t ask for anything more. 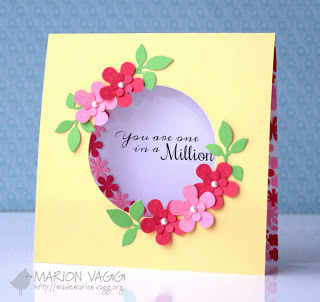 I was inspired by Marion Vagg’s window card with clusters of posies but wanted to have ample space to write a message on the inside so I made a window on the front instead. 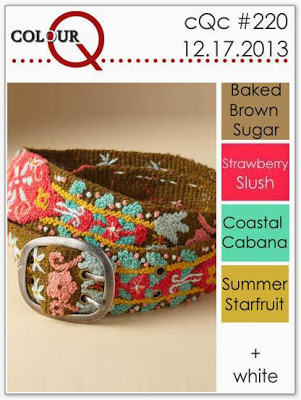 I used the ColourQ # 220 colors to make this card- boy, I think Summer Starfruit really mixes well with the Strawberry Slush, and Coastal Cabana. It isn’t one of my go-to colors usually, how do you think they look together? Love this! The Color combo is great! Thanks, Cathy. I did love working with the colors! This is such a rich and elegant take on this week’s Muse, Cindy! Thanks for joining us this week! See you in January! Wow–this is absolutely gorgeous! I could just sit & stare at your card, Cindy! Greta, you are too sweet! I loved your Dynamic Duos card in Black/Cherry Cobbler! Very pretty card, Cindy! I have the petals on on my wish list for after Christmas! Great use of the colours! Thanks, Karen. I think this set will be used a lot especially with the punch to go with it! This is such a gorgeous card! Congrats on being a ‘Featured Member’ at Muse!!! Beautiful card, Cindy! Happy Holidays and thanks for sharing with us at the colourQ. 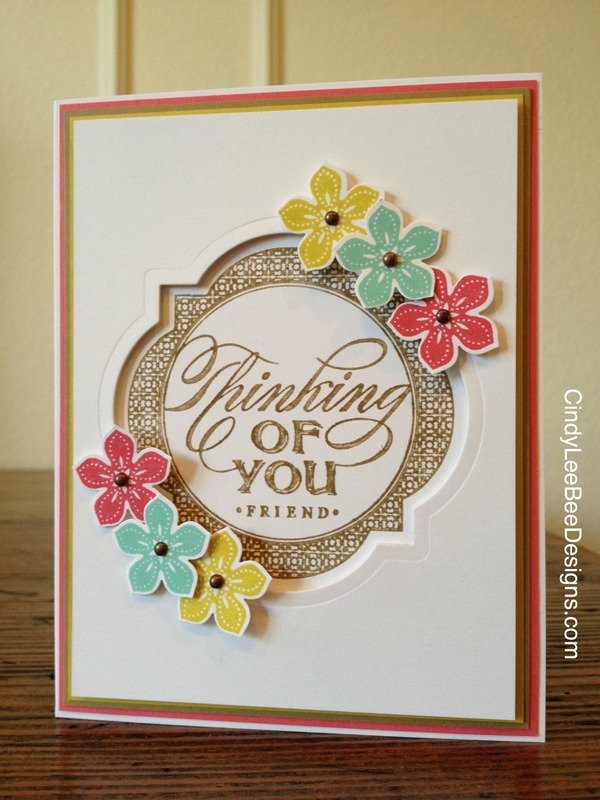 You’ve used the colors perfectly Cindy, this is a beautiful card!! Thanks so much for joining us at the ColourQ!! I love how you created the card, came out so beautifully! Curious, where you get the copper brads? Is it retired? Thank you, Jan. I just found some brads in my stash- I am not sure where they came from- I don’t think they are SU. They may be SU and are retired, though. Thanks for stopping by and leaving a sweet comment.